Plesetsk is an urban locality and the administrative center of Plesetsky District, Arkhangelsk Oblast, Russia, situated about 800 kilometers (500 mi) northeast of Moscow and 180 kilometers (110 mi) south of Arkhangelsk. Municipally, it is the administrative center of Plesetskoye Urban Settlement, one of eight urban settlements in the district. Population: 11,037 (2010 Census); 11,300 (2002 Census); 14,027 (1989 Census). Kargopol is a town and the administrative center of Kargopolsky District in Arkhangelsk Oblast, Russia, located on both sides of the Onega River, several miles north of Lake Lacha, in the southwestern corner of the oblast. Population: 10,214 (2010 Census); 11,192 (2002 Census); 12,495 (1989 Census). Kotlas is a town in Arkhangelsk Oblast, Russia, located at the confluence of the Northern Dvina and Vychegda Rivers. Population: 60,562 (2010 Census); 60,647 (2002 Census); 68,021 (1989 Census). Velsk is a town and the administrative center of Velsky District in Arkhangelsk Oblast, Russia, located on the left bank of the Vel River at its confluence with the Vaga River, 545 kilometers (339 mi) south of Arkhangelsk, the administrative center of the oblast. Population: 23,885 (2010 Census); 26,241 (2002 Census); 25,967 (1989 Census). Mirny is a closed town in the west of Arkhangelsk Oblast, Russia, serving the Plesetsk Cosmodrome. The town is located 9 kilometers (5.6 mi) from the urban-type settlement of Plesetsk and is connected to it by a road and a railway. Gorodskaya railway station is located within the town, being a terminus to cosmodrome's vast railway system. The Plestsy Airport is also located nearby. Population: 30,280 (2010 Census); 30,502 (2002 Census). Kotlassky District is an administrative district (raion), one of the twenty-one in Arkhangelsk Oblast, Russia. As a municipal division, it is incorporated as Kotlassky Municipal District. It is located in the southeast of the oblast and borders with Krasnoborsky District in the north, Lensky District in the northeast, Vilegodsky District in the east, Luzsky District of Kirov Oblast and Velikoustyugsky District of Vologda Oblast in the south, and with Ustyansky District in the west. The area of the district is 6,300 square kilometers (2,400 sq mi). Its administrative center is the town of Kotlas. Population: 21,005 (2010 Census); 24,964 (2002 Census); 32,800 (1989 Census). Lensky District is an administrative district (raion), one of the twenty-one in Arkhangelsk Oblast, Russia. As a municipal division, it is incorporated as Lensky Municipal District. It is located in the southeast of the oblast and borders with Udorsky District of the Komi Republic in the north, Syktyvdinsky, Ust-Vymsky, and Sysolsky Districts, also of the Komi Republic, in the east, Vilegodsky District in the south, and with Kotlassky and Krasnoborsky Districts in the west. The area of the district is 10,700 square kilometers (4,100 sq mi). Its administrative center is the rural locality of Yarensk. Population: 13,362 (2010 Census); 16,071 (2002 Census); 20,488 (1989 Census). The population of Yarensk accounts for 27.4% of the district's total population. Bereznik, also known as Dvinskoy Bereznik, is an urban locality and the administrative center of Vinogradovsky District of Arkhangelsk Oblast, Russia, located on the left bank of the Northern Dvina River, 192 kilometers (119 mi) southeast of Kholmogorskaya railway station and 276 kilometers (171 mi) from Arkhangelsk. Within the framework of municipal divisions, it serves as the administrative center of Bereznikovskoye Urban Settlement, the only urban settlement in the district. Population: 6,018 (2010 Census); 6,464 (2002 Census); 7,006 (1989 Census); ~4,000 (1968). Privodino is an urban locality in Kotlassky District of Arkhangelsk Oblast, Russia, located on the left bank of the Northern Dvina River 23 kilometers (14 mi) from Kotlas. Municipally, it is the administrative center of Privodinskoye Urban Settlement, one of the three urban settlements in the municipal district. Population: 3,161 (2010 Census); 3,264 (2002 Census); 3,154 (1989 Census). Ustyansky District is an administrative district (raion), one of the twenty-one in Arkhangelsk Oblast, Russia. As a municipal division, it is incorporated as Ustyansky Municipal District. It is located in the south of the oblast and borders with Verkhnetoyemsky District in the northeast, Krasnoborsky and Kotlassky Districts in the east, Velikoustyugsky, Nyuksensky, Tarnogsky, and Verkhovazhsky Districts, all of Vologda Oblast, in the south, Velsky District in the west, and with Shenkursky District in the northwest. The area of the district is 10,700 square kilometers (4,100 sq mi). Its administrative center is the urban locality of Oktyabrsky. Population: 30,581 (2010 Census); 37,131 (2002 Census); 45,352 (1989 Census). The population of Oktyabrsky accounts for 30.4% of the district's total population. Krasnoborsky District is an administrative district (raion), one of the twenty-one in Arkhangelsk Oblast, Russia. Municipally, it is incorporated as Krasnoborsky Municipal District. It is located in the southeast of the oblast and borders with Verkhnetoyemsky District in the north, Udorsky District of the Komi Republic in the northeast, Lensky District in the east, Kotlassky District in the south, and with Ustyansky District in the west. Its administrative center is the rural locality of Krasnoborsk. District's population: 13,815 (2010 Census); 17,144 (2002 Census); 20,491 (1989 Census). The population of Krasnoborsk accounts for 34.5% of the district's total population. Krasnoborsk is a rural locality and the administrative center of Krasnoborsky District, Arkhangelsk Oblast, Russia, located on the left bank of the Northern Dvina River. It also serves as the administrative center of Alexeyevsky Selsoviet, one of the ten selsoviets into which the district is administratively divided. Municipally, it is the administrative center of Alexeyevskoye Rural Settlement in Krasnoborsky Municipal District. Population: 4,771 (2010 Census); 5,030 (2002 Census); 5,110 (1989 Census). Verkhnetoyemsky District is an administrative district (raion), one of the twenty-one in Arkhangelsk Oblast, Russia. Municipally, it is incorporated as Verkhnetoyemsky Municipal District. It is located in the southeast of the oblast and borders with Pinezhsky District in the north, Udorsky District of the Komi Republic in the east, Krasnoborsky and Ustyansky Districts in the south, Shenkursky District in the west, and with Vinogradovsky District in the northwest. Its administrative center is the rural locality of Verkhnyaya Toyma. District's population: 17,060 (2010 Census); 22,630 (2002 Census); 27,989 (1989 Census). The population of Verkhnyaya Toyma accounts for 20.3% of the district's total population. Ilyinsko-Podomskoye is a rural locality and the administrative center of Vilegodsky District of Arkhangelsk Oblast, Russia, located on the right bank of the Viled River. It also serves as the administrative center of Ilyinsky Selsoviet, one of the ten selsoviets into which the district is administratively divided. Municipally, it is the administrative center of Ilyinskoye Rural Settlement. Population: 3,682 (2010 Census); 2,973 (2002 Census); 3,365 (1989 Census). Verkhnyaya Toyma is a rural locality and the administrative center of Verkhnetoyemsky District, Arkhangelsk Oblast, Russia, located on the right bank of the Northern Dvina River. It also serves as the administrative center of Verkhnetoyemsky Selsoviet, one of the fourteen selsoviets into which the district is administratively divided. Municipally, it is the administrative center of Verkhnetoyemskoye Rural Settlement. Population:3,462 (2010 Census); 3,940 (2002 Census); 4,430 (1989 Census). It is served by Verkhnyaya Toyma Airport. Shenkursky District is an administrative district (raion), one of the twenty-one in Arkhangelsk Oblast, Russia. As a municipal division, it is incorporated as Shenkursky Municipal District. It is located in the south of the oblast and borders with Vinogradovsky District in the north, Verkhnetoyemsky District in the east, Ustyansky District in the southeast, Velsky District in the south, Nyandomsky District in the west, and with Plesetsky District in the northwest. The area of the district is 11,298 square kilometers (4,362 sq mi). Its administrative center is the town of Shenkursk. Population: 15,196 (2010 Census); 18,680 (2002 Census); 22,597 (1989 Census). The population of Shenkursk accounts for 37.5% of the district's total population. 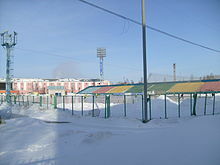 Obozersky is an urban locality in Plesetsky District of Arkhangelsk Oblast, Russia, located on the upper Vaymuga River, a tributary of the Yemtsa River in the Northern Dvina basin. Obozersky lies 133 kilometers (83 mi) south of Arkhangelsk. The name of the settlement originates from Lake Obozero, located south of Obozersky. Military airfield Letneozyorsk is located 3 kilometers (1.9 mi) southeast of the settlement. Municipally, Obozersky is the administrative center of Obozerskoye Urban Settlement, one of the eight urban settlements in the district. 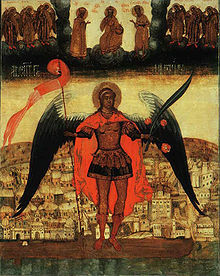 Population: 3,620 (2010 Census); 3,725 (2002 Census); 5,837 (1989 Census)..
Onezhsky District is an administrative district (raion), one of the twenty-one in Arkhangelsk Oblast, Russia. As a municipal division, it is incorporated as Onezhsky Municipal District. It is located in the northwest of the oblast and borders with Primorsky District in the northeast, Plesetsky District in the southeast, Pudozhsky, Medvezhyegorsky, and Segezhsky Districts of the Republic of Karelia in the southwest, and with Belomorsky District of the Republic of Karelia in the west. In the north, the district is washed by the White Sea. The area of the district is 23,740 square kilometers (9,170 sq mi). Its administrative center is the town of Onega. Population: 14,017 (2010 Census); 16,791 (2002 Census); 22,269 (1989 Census). 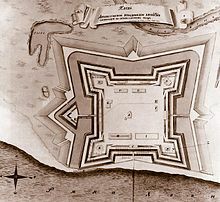 Primorsky District is an administrative district (raion), one of the twenty-one in Arkhangelsk Oblast, Russia. 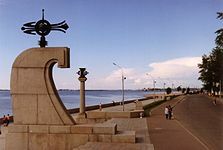 As a municipal division, it is incorporated as Primorsky Municipal District, and also includes Solovetsky Islands in the White Sea and Franz Josef Land and Victoria Island in the Arctic Ocean. It is located in the north of the oblast and borders with Mezensky District in the northeast, Pinezhsky District in the east, Kholmogorsky District in the southeast, Plesetsky District in the south, and with Onezhsky District in the south. From the north, the district is washed by the White Sea. The area of the district is 46,100 square kilometers (17,800 sq mi). 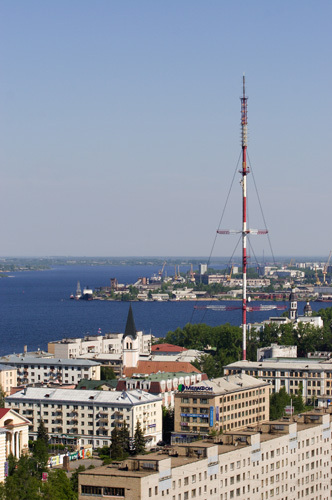 Its administrative center is the city of Arkhangelsk. Population: 25,466 (2010 Census); 29,365 (2002 Census); 31,813 (1989 Census).